Everyone should already know that memory bandwidth improves with increases in memory speed and reductions in memory timings. 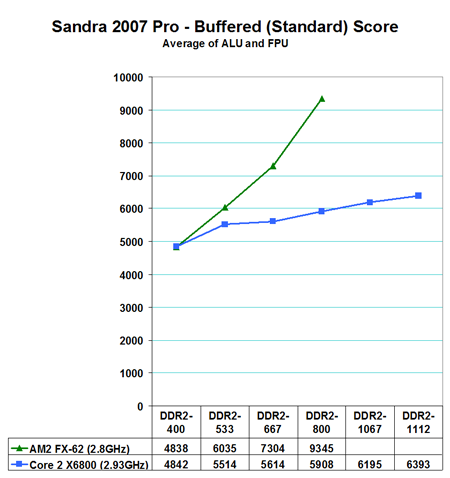 To better understand the behavior of AM2 and Core 2 Duo memory bandwidth we used SiSoft Sandra 2007 Professional to provide a closer look at memory bandwidth scaling. 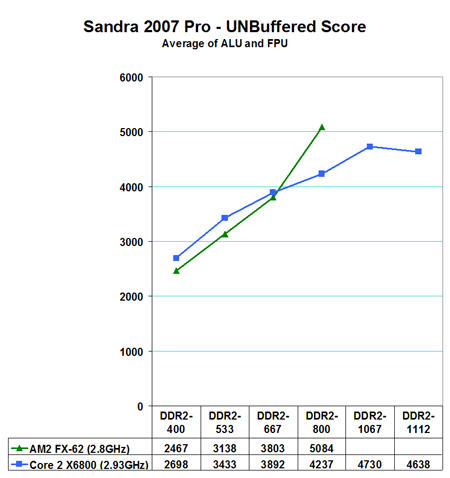 The most widely reported Sandra score is the Standard or Buffered memory score. This benchmark takes into account the buffering schemes like MMX, SSE, SSE2, SSE3, and other buffering tools that are used to improve memory performance. As you can clearly see in the Buffered result the AM2 on-chip memory controller holds a huge lead in bandwidth over Core 2 Duo. At DDR2-800 the AM2 lead in memory bandwidth is over 40%. As we have been saying for years, however, the Buffered benchmark does not correlate well with real performance in games on the same computer. For that reason, our memory bandwidth tests have always included an UNBuffered Sandra memory score. The UNBuffered result turns off the buffering schemes, and we have found the results correlate well with real-world performance. The Intel Core 2 Duo and AMD AM2 behave quite differently in UNBuferred tests. In these results AM2 and Core2 Duo are very close in memory bandwidth - much closer than in Standard tests. Core 2 Duo shows wider bandwidth below DDR2-800, but this will likely change when the AM2 controller matures and supports values below 3 in memory timings as the Core 2 Duo currently supports. The Sandra memory score is really made up of both read and write operations. By taking a closer look at the Read and Write components we can get a clearer picture of how the two memory controllers operate. Everest from Lavalys provides benchmarking tools that can individually measure Read and Write operations. The READ results are particularly interesting, since you can see that the READ component of Core 2 Duo performance is much larger than the WRITE results on Core 2 Duo. This is the result of the intelligent read-aheads in memory which Intel has used to lower the apparent latency of memory on the Core 2 Duo platform. Actual READ performance on Core 2 Duo now looks almost the same as AM2 to DDR2-533. AM2 starts pulling away in READ at DDR2-677 and has a slightly steeper increase slope as memory speed increases. The increases in READ speed in Core 2 Duo are a result of the intelligent read-aheads in memory. Performance without this feature would show Core 2 Duo much slower in READ operations than AM2. This is most clearly illustrated by looking at Everest Write scores. Memory read-ahead does not help when you are writing memory, so core 2 Duo exhibits much lower WRITE performance than AM2 as we would expect. This means if all else were equal (and it isn't) the AM2 would perform much better in Memory Write tasks. Surprisingly the WRITE component of Core 2 Duo appears a straight line just below 5000 MB/s. AM2 starts at 5900 at DDR2-400 and WRITE rises to around 8000MB/s at DDR2-667. Write then appears to level off, with higher memory speeds having little to no impact on AM2 WRITE performance. This fact will make our memory testing much simpler, and we plan to perform all upcoming memory testing on the currently more flexible Core 2 Duo test platform. AM2 buyers can expect similar results with the same DDR2 memory on their AM2 motherboards. I hope this means that you're going to do the tests on the Core 2 Duo test platform IN ADDITION to your current platforms. I hope this does NOT mean that you're going to do the tests EXCLUSIVELY on the Core 2 Duo test platform. So are you going to stop doing memory tests with AMD processors? How scientific is that? If you go to page 7 and look at the performance charts, you'll see that memory speeds have a much greater impact (pertage-wise) on the AMD setup than the Core 2 Duo setup. Well, I'm quite surprised that memory even made a difference. But since that is true (according to your tests), shouldn't be testing on AM2 instead of Core 2 Duo processors in the future because the difference is more marked? If there wasn't any significant difference on an Intel system, but a significant difference on an AMD system, you'd probably suggest that memory doesn't make a difference, commiting a type 2 error. Now, I don't care about memory. I always buy whatever is on sale. But making that conclusion would just piss off so many memory enthusiasts and memory sellers. And aren't those guys the ones that would be reading this article? As we explained in the article, AM2 currently does not support the DDR2-1067 speed, while the Intel chipset for Core 2 Duo DOES support 1067. Since most memory we test can reach 900 to 1067 or 1100 or greater the 1067 ratio is an advantage. Also the current AM2 memory controller does not support settings of 2 for Ras-to-Cas or tRef - AM2 only supports to 3. Core 2 Dupo supports faster timings of 2 at these settings. Since these lower settings are often usable in fast memory they can be very important. first of all I have to admit that this is the best Anandtech article for a long time. Everybody blamed me for being an AMD fanboy latley, however I do not have any problems to admit that Core2 is faster. I have one question left: Which BIOS version did you use with the AM2 board ? I recoginzed that DDR2 bandwidth scores increased quiet much compared to the initial tests. Now we have Sandra scores around 9.3 GB/s, however I remember that the initial ones were around 7.4 GB/s max. In conclusion I assume that there is some optimization going on, due to bios seetings. There the Asus board scored just ~7 GB/s, but a tested Foxconn board is again in the 9GB/s area. It maybe that the BIOSes are optimized for different kind of RAMs, too, as lostcircuit used OCZ memory, not Corsair. So can you also say which bios you were using for the Asus M2N32-SLI ? But I dont understand why you need DDR2 800 or 1000? DDR2 667 w/ tighter timings can run @ 333 1:1 ratio (333x9 for FX62). Many thanks to the AnandTech dudes for keeping us abreast with the CPU wars, and I personally hope you guys come out with more articles geared for the midranged ($1000-$1500) buyer.